Hey David Judge here and today we’re going to discuss tasks a VA cannot perform. This is about more than ‘they can’t make your coffee’ or ‘take out the trash’ as I’m going to delve in deep and talk about the idea of specialist and universal tasks. 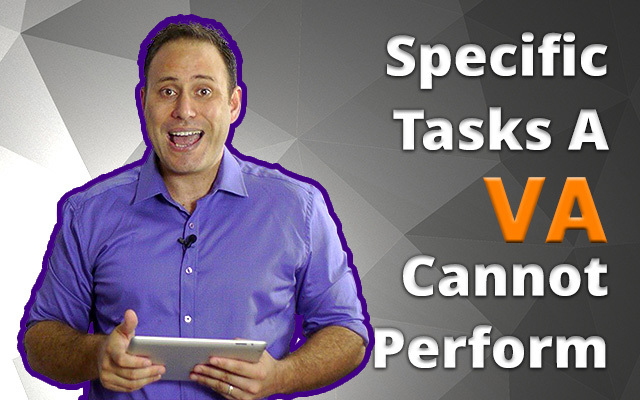 When I wrote this I thought I’d look to see what people think about VA’s and tasks they can perform and interestingly there was a lot of content around the tasks a VA can do, but really nothing around what they can’t. Even more interesting is during my research this time I’ve found a myth appear around the promise of a ULTIMATE VA, where ONE VA can perform every task known to man, for obviously a much smaller investment than employing locally. When you really think about this, how realistic do you think it would be for you to find a person in your local area that could perform every task imaginable (let alone finding a reliable employee) and with that in mind, why do you think it would be possible to find a person overseas that would fit that criteria? A Universal VA (UVA) is a person that can perform a number of general tasks in your business and a Specialist VA (SVA) is a person that would specialize in specific tasks. An SVA for example would be an Accountant, Server Administrator, Web Developer, Advanced Video Editor, or Advanced Content Writer. For this type of person to perform right away they would generally need to have a demonstratable experience or Formal Education around those disciplines. I’m saying if you are an Web Designer and you’re looking for a Digital Graphic Designer, it is highly unlikely they will be able to Accounting duties as this is simply not their discipline. Again, these are specialized tasks. Dependant on the level of task you’re outsourcing will be dependant on whether you’d need a Universal VA (that can cover a series of general tasks) or a number of Specialist VA’s that can focus on being really good at that particular task. That reminds me before I move on. If you check out here, you’ll get access to an eBook I’ve created called 743 tasks you can outsource to a VA, where I mention each tasks and whether a Specialist or Universal VA could perform it. With everything I’ve mentioned just now about specialist and universal tasks, there is a loophole where a UVA can perform Specialist tasks. I like to call these loophole… mindset and skillset. When I look at hiring a VA I first of all look for a person that would has the right mindset and a similar skillset to the specialist roles. I know if I can get a person with the right mindset and skillset then I can upskill and train them in certain specialist tasks. We use a number of specific tasks during the recruitment process to identify these types of people and now these are the only type of person we employ within our business. When we look at employing a VA for ourselves or a client I look at preparing a full list of all the tasks they may potentially complete I first of all look for a person with the right mindset, look at their skillset and finally test that VA in each of those tasks to see where they’re at and if this is an area I could train and upskill in the future. To be clear, whilst this still means there are times that you’ll have to employ a Specialist, there are also other times you can upskill your VA in specialist tasks if you follow the process I have mentioned just now! While I agree that it’s impossible to find a Ultimate VA, I do believe you can find a universal VA and if you recruit the right way, can definitely upskill that person in other disciplines if you invest the time and follow the right methods. So the idea of what tasks a VA cannot perform is as I said at beginning about more than just making you a coffee, it’s really about the style of tasks and whether you’ll need a specialist of a universal VA. In the next session we’re going to do something a little different. While I talk to a lot of people about outsourcing there is still a GAP for a business understanding ‘How’ a VA can specifically work in their business. With this in mind over the next few sessions I’m going to cover several case studies I call ‘A Week in the life of a VA’ where I delve in deep and share different VA’s working for different clients and a snapshot of the tasks they perform. These are going to be a massive treat as they will uncover the veil of uncertainty around how a VA could work for you in your business.